Editor’s note: This article was adapted from a news release distributed to the national media last week. PETERSBURG, Kentucky, November 23, 2015—The highly popular Christmas festivities at the Creation Museum—called Christmas Town—are returning this year with new additions, and once again featuring its centerpiece: a live Nativity. 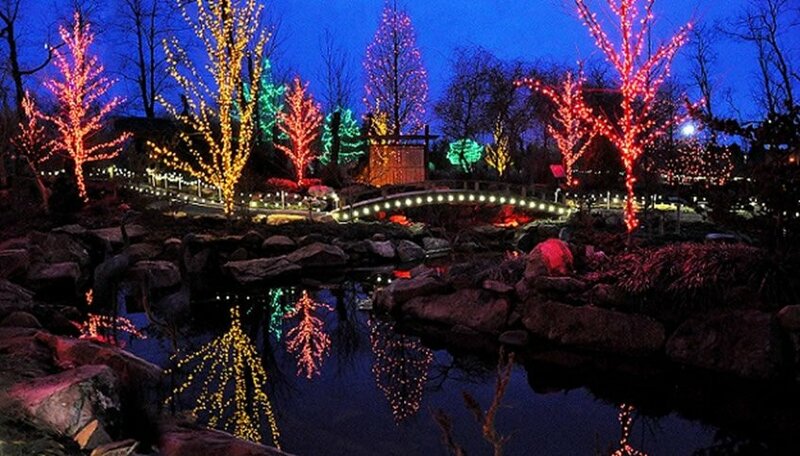 New for 2015 at this free event, even more lights (tens of thousands total) will be placed on the scenic property for guests to enjoy as they walk the pathways around the museum’s lake. In addition, there are now more Christmas shopping possibilities, including one that benefits an international charity. Attracting up to 25,000 people each season who drive an average of 132 miles one way, Christmas Town this year will be held most Friday and Saturday evenings in December, plus Monday, December 28. The dates are December 4–5, 11–12, 18–19, 26 and 28. The museum will be closed Christmas Day, which is a Friday. 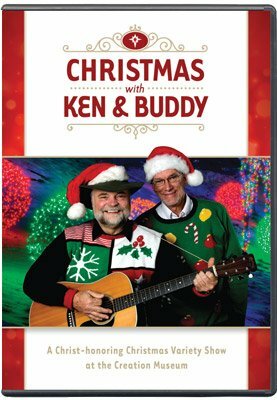 As a bonus, museum Founder and President Ken Ham will join recording artist Buddy Davis and several other special guests each Christmas Town day from 4:00–5:15 p.m. for a new, free program. 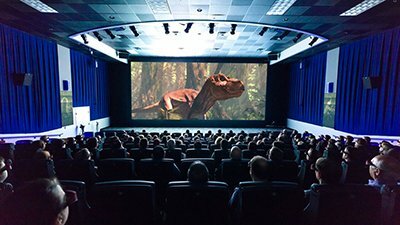 They will hold a fun, musical teaching event packed with memorable moments the entire family is sure to enjoy, including a visit from Rexy—the museum’s very own dinosaur mascot! Visitors can then walk outside to enjoy the lights as it begins to get dark after 5:15. Also new this year is the addition of fair trade shopping. Christmas Town visitors will have access to an area set aside for fair trade vendors. Handcrafted items including scarves, jewelry, bags and purses, ornaments, baskets, paper products (stationary, journals, and so on), and some kitchen items (wooden spoons, pot holders from Africa) will be available ranging in price from $5–$30. Fair trade signifies a buying relationship that creates an opportunity for economically disadvantaged artisans in the developing world by providing a sustainable market for their handcrafted products. The museum is happy to partner with vendors who share its mission to spread the gospel ( Matthew 28:18–20 ). With more lights, the addition of free trade shopping, and an all-new fun family program with Ken Ham, Buddy Davis and friends, museum officials expect to break the previous attendance record (weather permitting). Visitors traveling to Christmas Town . . . are encouraged to arrive even earlier this year due to expected traffic delays. Travel advisory: Visitors traveling to Christmas Town from the west are encouraged to arrive even earlier this year due to expected traffic delays on the Carrol Cropper Bridge (connecting Indiana to Kentucky). Construction taking place on the bridge is resulting in occasional traffic back-ups, especially during the 4–6 p.m. period on weekdays. To fully enjoy all that Christmas Town has to offer, an arrival before 4 p.m. is highly recommended (and in time to enjoy the 4 p.m. Christmas program featuring Ken Ham and musician Buddy Davis). Travelers from the east may also be affected by these construction delays, and should consider an alternate route utilizing exit 8 onto KY 237 south, then following KY 20 to the museum. The free Christmas Town celebration has become a favorite annual tradition for families in the Tri-State and beyond. To handle the expected crowds this year, a new walking route has been created through the brilliantly lit grounds to keep the lines moving, even on the busiest evenings. With a live Nativity as the event’s focus on the museum’s beautifully decorated grounds, Christmas Town presents the true meaning of Christmas as it provides families a glimpse into the amazing events surrounding the wonder of Christ’s birth. The Creation Museum is located in Petersburg, Kentucky, at exit 11 off I-275, only two exits west of the Cincinnati Airport. This year, Christmas Town will be held most Friday/Saturday evenings in December: December 4–5, 11–12, 18–19, 26, and Monday, December 28 (closed Christmas Day). Groundskeepers have just finished transforming the museum’s large property into a “Garden of Lights” featuring a breathtaking display of tens of thousands of Christmas lights. Previous visitors have indicated that it’s the most dazzling show of Christmas lights in the entire region. Inside the museum, an additional array of Christmas items will be on sale in the bookstore. The museum’s acclaimed planetarium will present its special ticketed program, The Christmas Star, about the mysterious star in the east that heralded the birth of Jesus and guided the wise men to Him. Noah’s Café will serve a tasty turkey dinner (only $6.99), and will also offer an assortment of other festive food and drinks for sale. While Christmas Town will be a fun, highly visual experience for families, it is also a time to reflect on the greatest gift ever given to us: the free gift of salvation through Jesus Christ, who was the Babe in the manger. Christmas Town at the Creation Museum is our way to say “thank you” to our community for its support and to offer families a free gift at Christmas—complimentary admission to Christmas Town. Christmas Town is open 5–8 p.m. 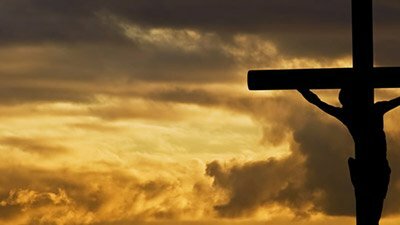 ET, with the prelude featuring Ken Ham, Buddy Davis and friends, beginning at 4 p.m. All the outdoor activities (except for the camel rides and zip line) are free. Inside, museum admission on Christmas Town days is only $5 after 5 p.m. (last entry is at 8 p.m.) The 4 p.m. Christmas program in Legacy Hall does not require a museum ticket to enter and is free to all (seating is limited and available on a first-come, first-served basis, so early arrival is recommended). A free Christmas booklet will be given to each family, and children will receive a complimentary Christmas coloring book (while supplies last). More information about all of the special Christmas events, plus details on purchasing tickets for the zip line, planetarium programs, and discounted Creation Museum admission during Christmas Town, can be found at CreationMuseum.org/christmas or by calling (888) 582-4253. 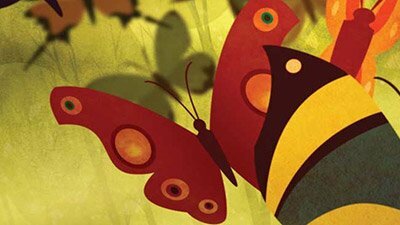 The Creation Museum is an outreach of the apologetics organization Answers in Genesis. AiG is constructing a full-size Noah’s Ark on 800 acres in Williamstown, Kentucky, to open on July 7, 2016. See ArkEncounter.com. For information on AiG, visit AnswersInGenesis.org.